The happiest, most content people I know in my own life are actively creative in some way, shape, or form. Creativity looks different on each of us, right? 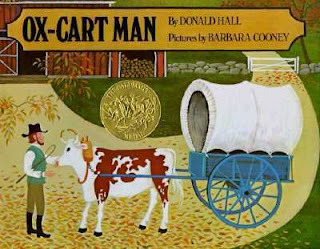 Incidentally, Gabrielle Blair (who I've read a lot about lately, first on the indescribable blog nat the fat rat, then in my alumni magazine) also mentions her favorite picture book of all time, Ox-Cart Man by Donald Hall. She makes is sound so lovely that I've put it on hold at my library already. What do you do to stay actively creative? I'd love to hear about it. Have you got a blog? Leave a link in the comments. Do you clean? My sister-in-law says she's not creative, but she can create a clean space out of a dirty one in seconds. It's amazing. Well, I think you already know what I do to be creative, which is chemistry. People don't often think of science as a creative endeavor, but it most certainly is. Coming up with new ideas and ways to solve problems requires a lot of creativity. Having something creative to do daily really does help keep me happy and satisfied. Wow, that's a really good point, hon. Wehn you said I already knew it I was in suspense a little -- I couldn't think of what it was. Haha. But it's so true -- scientific problem solving definitely requires creativity! I definitely agree with that quote. I'm always creating something - sewing, writing, spinning, quilting, embroidering, whatever, and I'm perfectly happy and content. I write! And read. I think reading is definitely a creative process. I like doing crafts and the like, but I can't seem to find much time for them...I guess reading and writing are more important to me! I also enjoy blogging. 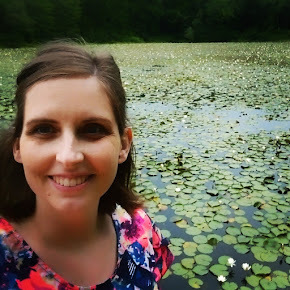 megwrites - I completely agree about reading being a creative process. It's something I hadn't really considered until a couple years ago (though it's a creative pursuit I'd participated in for a long time before). But readers definitely create their own personal imagining of a story when they read. Some people are creative and don't even know it! Being able to redirect a two-year old into appropriate behaviors is being creative; putting together a wonderful ensemble is being creative; being a good therapist or coach is being creative. I encourage you to find other ways to recognize your creativeness! I forgot to leave my blog site. I am a person who wilts without stretching my creative muscles. I just need it. But I also find a difference in the nourishment that I get from creating that is my passion verses creating that is more utilitarian. That's a difficult sentence, but here's how it plays out: If I create a great meal, a knitted scarf, a poster for our homeschool, a beautiful garden plot, I feel good. Really good. I love those things, that's why I have chosen to do them and learned to do them. But if I go too long only doing creative things that are outcome dependant, then I find myself needing more creative play. For me creative play is a very private, vulnerable thing that I can rarely do in social settings. (Usually doesn't work at a craft night for example.) I love cutting and gluing paper and not knowing if it will work out, or not even having a vision for how it will work out, just going with one decision at a time. I really have to work to overcome the idea that play is a waste of materials, time, or energy. That first splotch of paint on the paper just kills me, I have to really work hard to not run away from the vulnerability of it. But once I do, ah! That's where I get my "soul food." An hour or two later I'll come out of the room just feeling refreshed, excited, and probably holding a few things I want to show you. (Things I had no idea I would come up with when I went in.) That's the magic part. I highly recommend Elizabeth Gilber's TED talk on this subject. I believe it's called Your Elusive Creative Genius or something similar. It has a great metaphor in it that has become a household quote. Bethany, I really liked that TED talk! I watched it some time ago, though, and have forgotten the metaphor. But I remember the story about the woman who was a poet, running in to write a poem down.